Former Jail Site:16 Cedar Street, vacant lot; Former Courthouse/City Hall bounded by Court, Church, and School Sts. Image courtesy of the Otis Library. 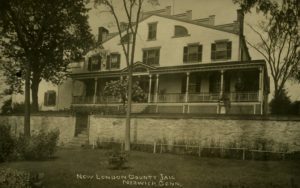 This spot was the site of the circa 1833 New London County jail, the long-vanished namesake of Jail Hill. With separate accommodations for female and male prisoners, this facility, modern for its day, had its own kitchen, laundry, work area, and chapel. The jailer lived with his family in a house separated from the main building by iron gates. Prisoners worked from 7 AM until dusk, with a thirty-minute lunch break at noon; as of 1867, their jobs included reupholstering chairs and beds. An addition was added to the facility in the late nineteenth century; the entire complex was torn down in the 1950s after a new correctional facility was constructed in Montville. At the bottom of the hill, on the corner of Court, Church and School Streets, were the 1829 courthouse and city hall. In 1835, abolitionist speaker Henry B. Stanton was greeted here by a mob that stoned the building, breaking windows and seriously injuring a peace officer. Here in 1860, a friendly audience of local Republicans heard Abraham Lincoln deliver a reprise of his famous “Cooper Union” speech, in which he built a case for the restriction of slavery to the South, as opposed to its expansion into the Western territories. The courthouse was destroyed by fire on April 11, 1865, three days before Lincoln’s assassination at Ford’s Theatre in Washington, D. C.